Marie Méon, a French-Japanese chef who grew up in Tokyo, lives in Paris and is the founder of Manger Manger, a company combining cooking, teaching, restaurant design and event-management. For Inside/Out she designed six seasonal recipes, displayed on artisanal Shopu tableware pieces from Japan, selected by Nathalie Agematsu, between design, art and handicraft. Salad leaves, wakame, persimmon, homemade ricotta & Japanese vinaigrette salad. Wash the vegetables, dice the beetroot and the carrot (peeled with a Japanese mandolin) and let them harden in a bowl of cold water. Peel the persimmon and cut it into 4 quarters. Rehydrate the wakame for 15 minutes in a bowl of water, then drain it thoroughly. Bring the milk to a boil in a pot. When it starts to simmer, add salt, lemon juice, stir gently with a wooden spatula, and turn the heat off. Cover and let the milk curdle for 5 minutes. Strain in a fine sieve and collect the “solid” part. Set aside in the fridge. Combine all ingredients in a large salad bowl. Dress with vinaigrette. Sprinkle with crumbled ricotta. Serve. 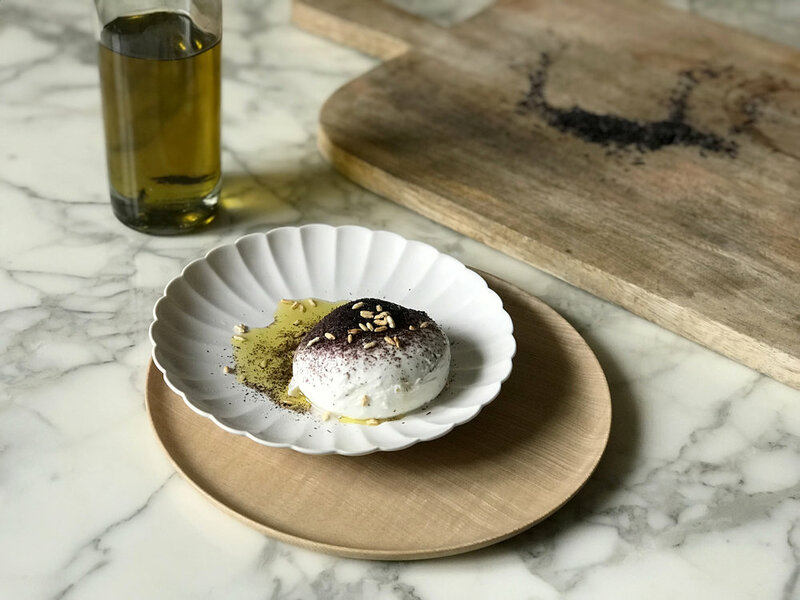 Mozzarella, powdered seawood and puffed rice. Grind the dried seaweed, salt and pepper into a fine powder. Set aside. Fry the uncooked rice for 2 to 3 minutes in very hot oil, then set the grains on absorbent paper. Add salt while still hot. Arrange the mozzarella on plates, add olive oil, sprinkle with seaweed powder (with a fine strainer) and fried rice. Thank you: Pauline Wormser and Marie Persyn at Such&Such.